When in Mongolia someone told me an old tale about a woman who disguised as a man, competed in the wrestling competitions, thrashed all the male competitors and became the champion, disgracing them all. Since then the tight vest or Zodog purposefully exposes the chest avoiding another impostor repeating this shameful event. 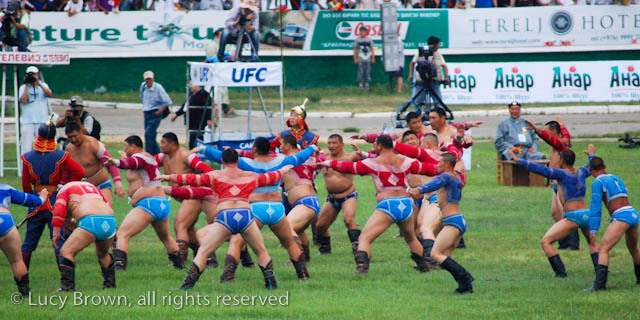 Traditional Mongolian wrestling competitions are all male and are full of ancient rituals. There are no separate weight classes and no time limits and the wrestler whose knee or elbow touches the ground loses the match. After the opening ceremony for Nadaam the wrestling contests began. Wrestlers psyching themselves up while waiting to compete. Before and after each match the wrestlers perform the Eagle Dance or Devekh, a ritual symbolizing power and invincibility. Several fights occur at the same time. Judges and assistants watch the competitors. Also check out my blog post on Nadaam horse racing on the steppe. This entry was posted on November 30, 2010 by loca4motion. It was filed under Asia, Mongolia and was tagged with culture, festival, mongolia, mongolian wrestler, mongolian wrestling, nadaam, photography, sport, traditional costumes, traditions, travel, ulaanbaatar. you a shout out from Porter Texas! Just wanted to say keep up the excellent job! Thank you so much! It’s always good to know people are enjoying my photos!